In the span of 10 minutes on Sunday afternoon, Texas' two senators engaged in what was — by Senate standards — a tough exchange on the chamber’s floor. WASHINGTON — When John Cornyn was installed as U.S. Senate majority whip in January, he was optimistic that his party's takeover of the chamber would translate into harmony between the establishment wing of the GOP that he represents and the Tea Party wing that includes his junior senator from Texas, Ted Cruz. But that has not happened, and on Sunday the two men shared a strikingly tough exchange for two senators not just from the same party, but the same state. “I have listened to the comments of my colleague, the junior senator from Texas, both last week and this week, and I would have to say that he is mistaken,” Cornyn said. At issue: Cruz on Friday accused Senate Majority Leader Mitch McConnell — a Cornyn ally — of telling a “flat-out lie” to Senate Republicans over movement of legislation related to an obscure, controversial federal agency called the Export-Import Bank. For Senate standards, it was a savaging comment. In his capacity as the Republicans' No. 2-ranking senator, Cornyn is a member of the party leadership that Cruz has taken to assailing on a daily basis in the last month. 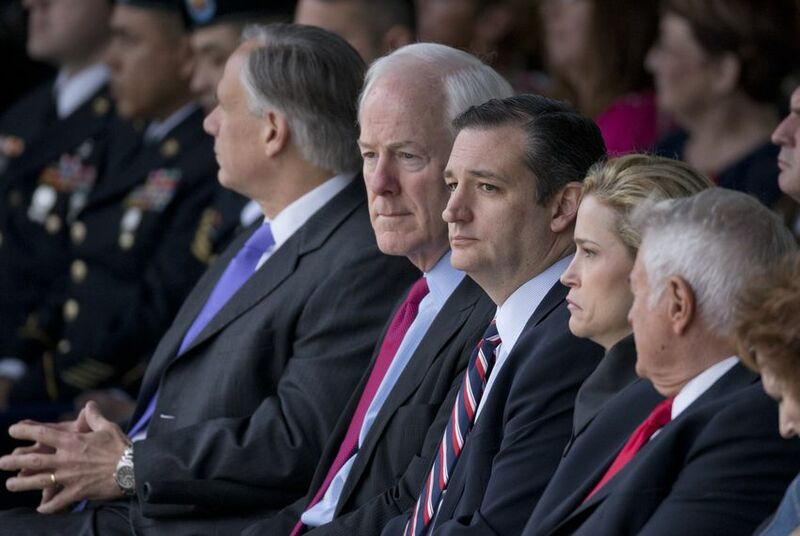 Since Cornyn became majority whip, Cruz has announced his presidential candidacy, escalated his courtship of the anti-establishment conservative bloc of the GOP, proved to be an unreliable vote on consequential legislation and directed veiled criticism at Cornyn in his recent memoir. The Senate's rare Sunday afternoon session followed two days of outrage from Capitol Hill Republicans toward Cruz for his comments about McConnell. Cruz defended his actions on the floor. “No member of this body should engage in ad hominem attacks directed at any member of this body, be they a Republican or be they a Democrat,” Cruz said. “At the same time, I would note that it is entirely consistent with decorum, and with the nature of this body traditionally as the world’s greatest deliberative body, to speak the truth,” he added. “Speaking the truth about actions is entirely consistent with civility." Cornyn took the floor immediately after Cruz. He backed McConnell’s procedural maneuvers that stifled a Cruz amendment on Iran. And Cornyn questioned the legitimacy of Cruz’s charges against McConnell. “There was no misrepresentation made by the majority leader on the Ex-Im Bank,” Cornyn added. Neither man addressed the other directly in his remarks. But it is a detour from Cornyn's hopeful comments seven months ago. "All of us have been enormously frustrated by being in the minority and by Harry Reid not allowing us to do our job and to represent our states,” Cornyn said in January of the former majority leader. “That’s going to be different," he added. “I think that it will be an enormous relief valve for pressure that’s been built up over the last few years." In an interview with The Texas Tribune last month, Cruz addressed whether his criticisms of Senate leadership included Cornyn. Cornyn later questioned charges Cruz made in the book. The Senate was in session Sunday to address several amendments related to a must-pass bill to replenish the Highway Trust Fund, set to expire on Friday. In a resounding vote, the Senate voted to push the Ex-Im Bank through procedural hurdles and will likely attach its reauthorization to the highway bill. The move sets up a clash between the House and the Senate over the legislation. Several powerful Ex-Im Bank critics on the House side gave every indication they intend to fight against the bank tooth and nail. Two chief Republican critics are from Texas: House Financial Services Chairman Jeb Hensarling of Dallas and Republican Study Committee Chairman Bill Flores of Bryan.